New Sports Minister Mims Davies has praised the work of StreetGames after Sport England announced it will invest £6.65million in the leading Sport for Development charity. The funding, provided by the National Lottery, will support a new three-year programme aimed at tackling physical inactivity amongst young people in 50 of England’s most disadvantaged areas. The funding will enable StreetGames to build on 11 years of crucial work, harnessing the power of sport to enhance the life-chances of young people growing up in deprived areas. Read ConnectSport’s exclusive interview with StreetGames CEO Jane Ashworth on 'building stronger communities through sport and physical activity'. In response, StreetGames has worked with more than 1000 locally-trusted organisations that are embedded in their communities to bring the benefits of sport and physical activity to more than 530,000 young people. StreetGames’ sessions and events have now recorded a remarkable 3.86million total attendances, involving 6,182 coaches and some 15,000 volunteers. Sports Minister Mims Davies said: "StreetGames makes a real difference to hundreds of thousands of children's lives, teaching them important skills and improving mental and physical wellbeing. “It is vital that we continue to create opportunities for everyone to access sport and I am delighted that, through National Lottery funding, this fantastic programme will reach even more young people across the country." This Sport England investment will be used to create new opportunities for young people to get active in the 50 disadvantaged areas, targeting those who are currently inactive or struggle to maintain their exercise habits. Jane Ashworth said: “StreetGames is absolutely committed to improving the lives of disadvantaged young people and their communities through sport, not only getting them more active but ensuring we support their mental and physical wellbeing, develop them as individuals within their communities, combat inequalities and help build an activity habit that stays with them for a lifetime. Sport England CEO Tim Hollingsworth CEO commented: “Our Active Lives surveys show that too many young people are not doing the recommended levels of physical activity for their health, with those from low income families even less likely to be active. 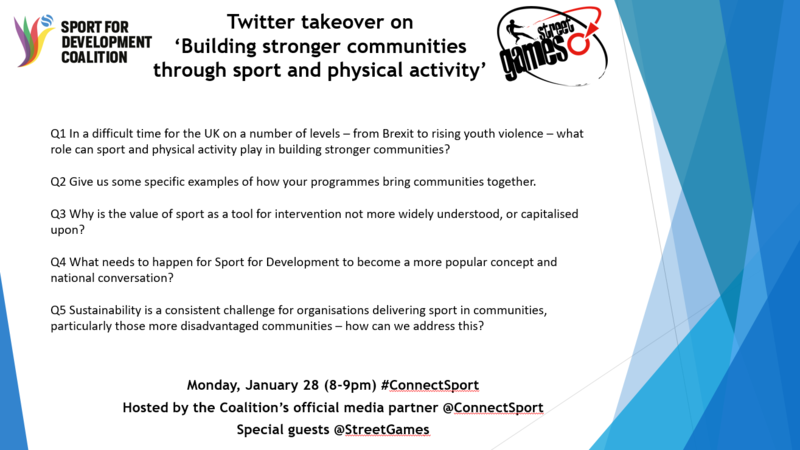 You can hear from StreetGames Deputy CEO Mark Lawrie, and send him your questions, when ConnectSport hosts the Sport for Development Coalition’s latest Twitter takeover on Monday evening. Join us from 8-9pm using the hashtag #ConnectSport. Find out more about StreetGames on their ConnectSport directory page. To add your organisation to the directory, contact hello@connectsport.co.uk.